Price includes a one color imprint on this 24 oz. bike bottle featuring a wide mouth and 63 mm twist open push-pull lid. Made with the safest plastic in drinkware so you can taste your water and not your bottle. Custom printed Eco-Polyclear® bike bottles are perfect for outdoor company functions, or for sporting your retail brand to sell or give away. 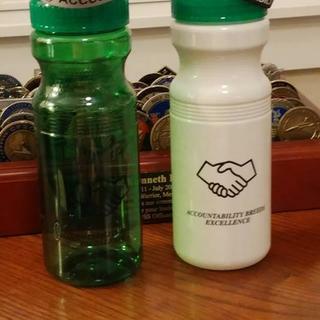 BEST ANSWER: Yes, these bottles are eco-friendly. The bottles are just what I wanted! The colors are great and my quote looks awesome on there!